Amidst rain showers dotting the area surrounding the spaceport in Kourou, French Guiana, Arianespace successfully delivered two telecommunications satellites to geosynchronous transfer orbit (GTO). Flight VA237 saw the Ariane 5 lift off the pad at 7:45 p.m. EDT (23:45 GMT) on June 1, 2017, marking the launch provider’s sixth mission of the year and earning a new record in the process. Though the weather wasn’t perfect, it proved little more than a side-note as the launch team progressed through the countdown. At T-minus 0 seconds, and at the opening of the one-hour launch window, the core stage’s Vulcain 2 roared to life. 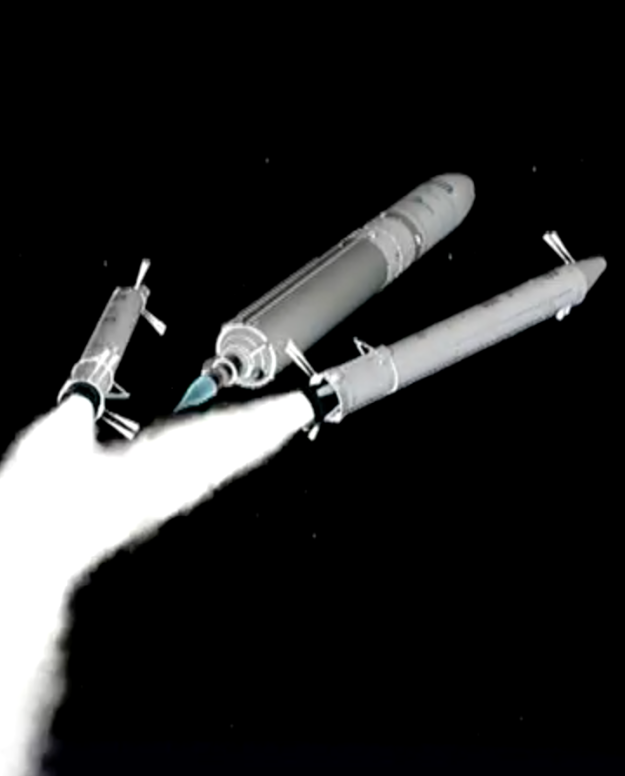 After passing health checks, and approximately seven seconds after main engine ignition, the flight computer signaled the twin P241 solid rocket boosters (SRBs) to ignite. 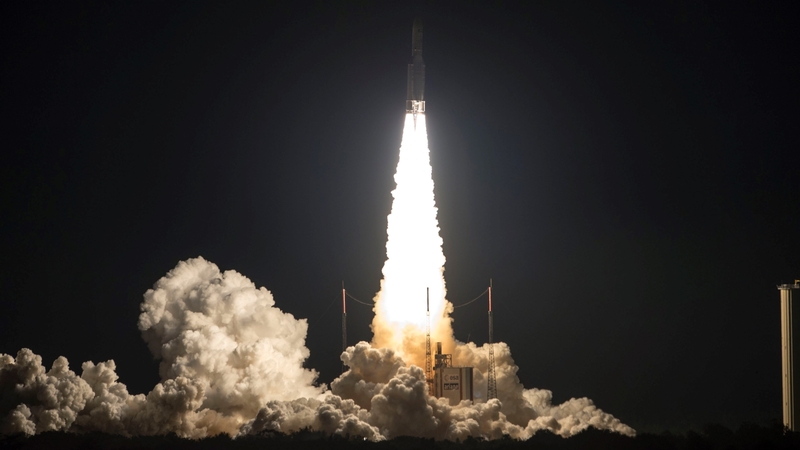 With a combined 2.92 million pounds-force (13,000 kilonewtons) of liftoff thrust, the 180-foot (54.8-meter) tall Ariane 5 climbed from the pad and soared into a cloudy nighttime sky. The output from the three engines was more than enough to lift a record 23,953 pounds (10,865 kilograms) of orbited mass (satellites, along with accompanying adapters and hardware). Not long after clearing the launch tower, the vehicle turned eastward and climbed over the Atlantic Ocean. As the rocket ascended, atmospheric pressure reached its maximum impact on the vehicle’s structure. This region of high stress is called “max Q” and is a function of the vehicle’s speed combined with the pressure exerted on the rocket by the surrounding air. 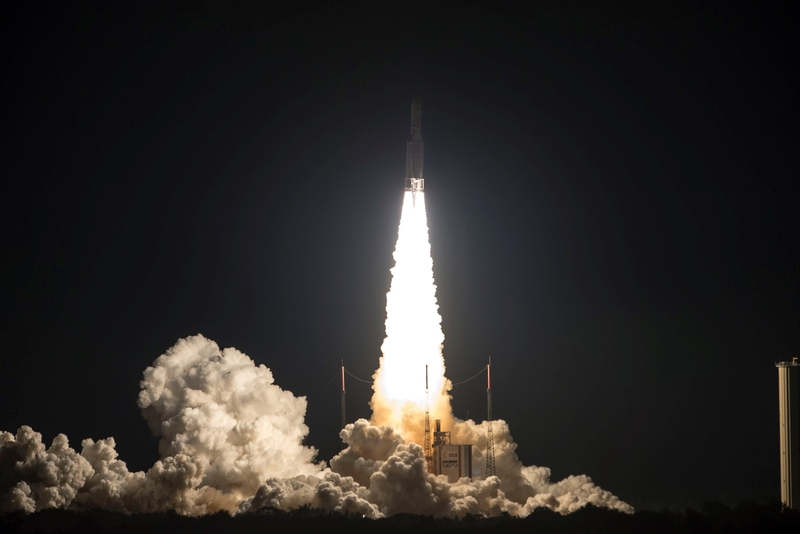 Nearly simultaneously, the Ariane 5 surpassed Mach 1 – the speed of sound – as it continued its rapidly accelerating climb to orbit. Slightly more than two minutes after ignition, and nearly 44 miles (70 kilometers) in altitude, the Ariane’s pair of P241 SRBs exhausted their solid fuel and were jettisoned. The spent motors splashed down into the Atlantic Ocean and were not recovered. Though the SRBs account for more than 90 percent of the thrust at liftoff, the core stage’s Vulcain was then able to supply the power necessary to continue accelerating the significantly lighter vehicle. While the Ariane and its payload tipped the scales at 1.72 million pounds (780 metric tons) on the pad, the core stage now weighed a fraction of its liftoff mass after having jettisoned the SRBs and consuming a significant portion of its cryogenic propellant, burning through approximately 700 pounds (317.5 kilograms) of fuel and oxidizer per second. Approximately three-and-a-half minutes into the flight, and at 68 miles (110 kilometers) in altitude, the Ariane jettisoned its protective payload fairing. Though the aerodynamic shell protects the vehicle and its payload from acoustic, aerodynamic, and thermal stresses in the lower, thicker parts of the atmosphere, it becomes unnecessary mass – and an impediment to payload deployment – once in the vacuum of space. The Vulcain main engine powered the vehicle for nearly nine minutes, and, once the core stage was emptied of its liquid oxygen (LOX) and liquid hydrogen (LH2) propellant, it separated from the ESC-A (second) stage and fell into the Atlantic Ocean off the coast of Africa in the Gulf of Guinea. More than 29 minutes after lifting off, the second stage was in a position to deliver the first of its two passengers to the 155-mile (250-kilometer) by 22,187-mile (35,706-kilometer) transfer orbit. ViaSat-2 was the first to separate from the SYLDA payload carrier as the vehicle passed south of the Horn of Africa. 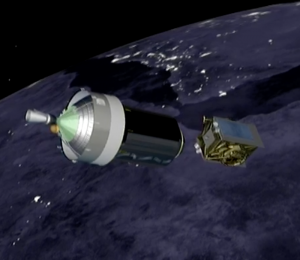 After the Boeing-built satellite was clear of the vehicle and at a safe distance, SYLDA was jettisoned, exposing EUTELSAT 172B and providing the European telecommunications satellite a clear path to deploy. It is hoped that ViaSat-2 will herald a seven-fold increase in broadband internet coverage (with potentially as much as twice the capacity of its predecessor). Following a 6-minute coast, during which time SYLDA drifted away, the second satellite was released due south of India. EUTELSAT 172B, like its ViaSat-2 launch mate, was now flying free of the ESC-A upper stage. Flight VA237 marks the sixth mission for Arianespace in 2017, with six more left on the manifest for the year. Coming next for the French multinational launch provider is the launch of another Ariane 5 for Flight VA238, scheduled for June 28, 2017. Crazy Europeans and their odd way of doing countdowns. The clock reaches zero, the engines fire and then it sits there. And sits there. Finally, seven seconds in, it lifts off. I always think something is wrong watching their launches.